CD review: "Between Midnight and Day"
This review first appeared in the January 19, 1996 issue of the North County Times. 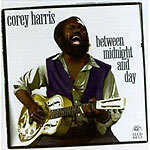 If you're old enough to remember when Taj Mahal burst on the scene some 30 years ago, a red-hot young black guitarist dedicated to preserving the history and integrity of his cultural heritage, well, then, you'll be prepared for the intensity of Corey Harris' acoustic blues. If you don't remember Mahal, best get prepared to be blown away by a singer/guitarist who wasn't yet born when Mahal turned the blues world on its head with his uncompromising devotion to tradition. The songs on Harris' debut range from covers by blues giants like Muddy Waters, Jesse Fuller, Sleepy John Estes, Bukka White and Charley Patton to Harris' own compositions that sound like they came right out of the turn-of-the-century Mississippi Delta. Harris is all of 26 years old, but already plays some of the meanist steel-body guitar-based blues you're likely to encounter. In additino to some fine slide playing, Harris is a vigorously focused singer who projects a world of emotion into his minimalistic lines. While traditional, the music here is never a museum piece; Harris won't allow it. The intensity of his playing, his absolute involvement in every note make this as contemporary a recording as any with synthesizers or drum machines.